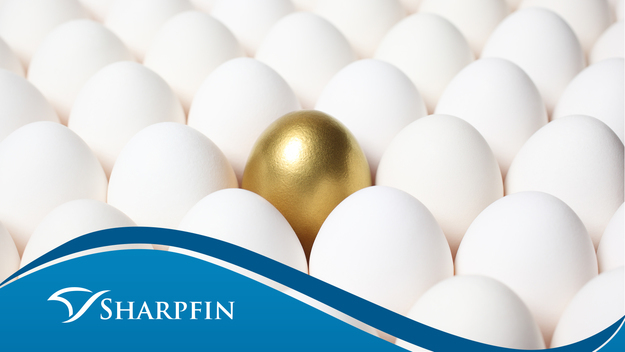 Sharpfin lives the vision to automate the EUR 80 trillion assets wealth management industry. Invest in one of the most promising B2B Fintech companies with proven business model and growing customer base. This funding round uses a holding company structure for investors which means that the investors won't hold shares directly in Sharpfin AB. Please read its description from the "Information on the issue terms" section. Imagine you spend 15 years working in the financial industry and during these 15 years hardly ever hears anyone who are impressed or even satisfied with the software that they are using. In an industry which manages the total of the worlds wealth… and makes piles of money out of it. Then you start thinking about other business and companies, such as Apple where the customer satisfaction is huge and you get puzzled and start wondering why? How can this be? The finance industry has been doped with too much income during too long time and has never really been forced to become efficient or user friendly. The banks themselves has driven the IT-development and banks are good at managing wealth. Banks are not good in the handcraft of developing software. At Sharpfin, we are proud of our focus to deliver a system which automates all the error prone and time consuming work and provides an intuitive interface for user interaction. This focus has been very well received by the market and apart from the customers that are already using our system to their fullest satisfaction, there are many others interested in our solution. We strongly believe that this disruptive way of supporting wealth managers in their daily work will take us to the position of being the number one portfolio management system globally. Please watch our product introduction video from here. 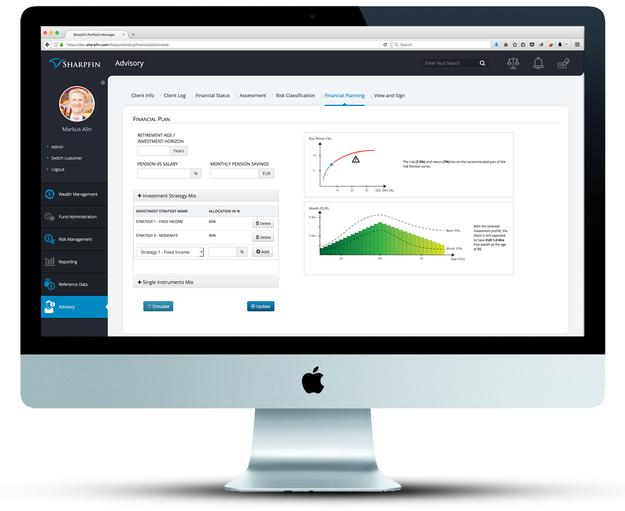 Sharpfin AB develops and delivers Sharpfin Portfolio Management (SPM), the next generation of wealth management software for banks, financial advisors, asset managers and family offices. 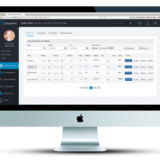 We utilize our vast experience in the wealth management software industry to design and build the most efficient portfolio management software on the market today. enjoy the benefits of a highly attractive payment model which grows automatically with the size of their managed investments. Having a more traditional license model, based on e.g. number of users, would, for us, be very counter productive since we are in the business for cutting cost, hence head count for our customers. The latter is also highly beneficial for you as an investor since it provides a predictable growth as we attract more but also larger customers. Our operational efficiency is way above our competition. E.g. in the last customer acquisition, we won the deal against a competitor which has 10 times more personnel than we do. Sharpfin covers all aspects of the wealth management process and ensures that adjacent processes are optimally integrated in our product workflow. This makes us highly efficient in the cumbersome administrative tasks that plague many parts of today’s wealth management process. Measured on the most common of these tasks, we are 50–80% more efficient than our competition, which means radically reducing the money and resources spent by our clients. In addition, the work is performed with more efficiency and higher quality through Sharpfin’s extensive automation. One aspect of our competition’s inefficiency is the prevalence of batch processing. 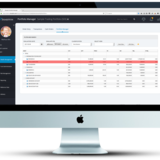 Due to high volumes and old IT systems, end-of-day processing is often the only way to produce customer data such as performance figures. 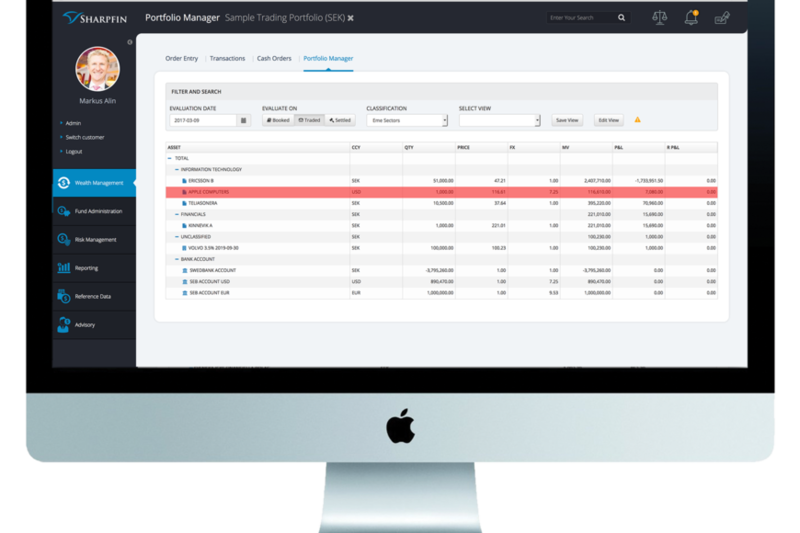 By contrast, Sharpfin Portfolio Management System is based on the same technology platform as e.g. Whatsapp and Klarna, hence built for scalability and produces all calculations in real time for volumes that competing systems could only dream of. 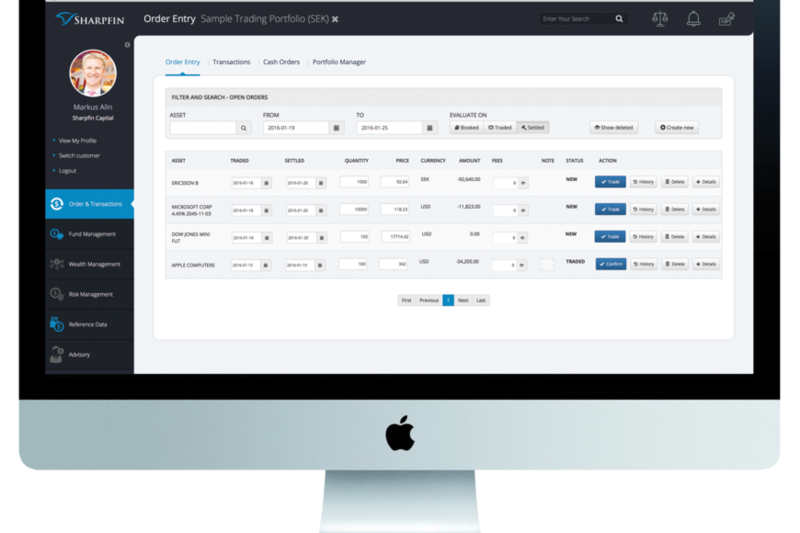 Our transactions reconciliation engine - Saving our clients a lot of time when keeping the system up to date with interfacing systems such as trading systems and custody. Our bookkeeping algorithm - An artificial intelligence algorithm which quickly learns how to book the financial securities transactions on to the general ledger accounts, hence saving a lot of time on processes which used to cost a huge amount of time and money. Today our product offering best targets asset management companies in the Nordic countries. Larger customers are often more demanding when it comes to delivery and sales capacity. Therefore we currently target customers up to EUR 500 Mio Assets under Management (AuM). As Sharpfin grows and the software’s functionality is extended, we will take on other markets and larger wealth managers starting with German-speaking Europe and the Benelux countries. As our delivery capacity allows us for a broader expansion we will also focus on the Arabic and South African market. They are often better to adopt to new solutions than European legacy banks and investors from our seed round are well networked to the finance industry in these regions. We particularly target customers who will be affected by coming regulatory changes such as MiFID II. MiFID II stands for Markets in Financial Industries Directive Two and is the most disruptive regulation in the finance area to date. Many of our potential customers currently either use systems that will struggle to become MiFID II compliant or they currently have no system support at all, for example, using Microsoft Excel as their tool for wealth management. The MiFID II directive will become effective on January 3, 2018 according to the current schedule; and many financial institutions will face system changes caused by the regulations for years after that. Our CEO, Markus, has deep insight in this regulation after a consultancy at the Swedish bank, Swedbank and naturally the intelligence has been incorporated into Sharpfin, giving us a huge advantage compared to our competitors. To further support this disruptive regulation we have just shipped our most recent module - Sharpfin Advisory. Watch our explainer video here. According to customer feedback we have heard, some of our Swedish competitors have not managed the technology transformation well because outdated technology burdens them with problems of profitability and customer satisfaction. Of the other competitors in the Swedish market, Finland-based FA Solutions has the best technology and the best reputation. They currently are taking market shares, although we won our last customer deal in direct competition with them. In the global arena we count Simcorp, Charles River Development and Advent Software to our biggest competitors. Simcorp and Advent software, today face valuations of more than EUR 2 billion. We have a growing customer base and successfully on boarded our first customers. Many more are interested in our system, but currently we can only grow slowly because of our current delivery capacity. There is no doubt that we will be able to grow quickly on the customer side once we have completed the next investment round and we have turned the funding into valuable development resources. Consensus Asset Management is a highly successful portfolio and asset manager. The company currently manages around SEK 3 billion, and it is growing fast. Consensus is listed on AktieTorget. Their major share holder is Hedin Bil, one of Sweden’s major car resellers. Consensus currently run our block order management and client reporting applications. Privat Consult is an Austrian wealth manager that manages a number of investment funds and discretionary mandates at a total volume of 300 Mio EUR. They target a vast network of wealthy individuals. Privat Consult uses SPM in their risk management to lower their clients’ investment risks. flexible compliance rules engine we now have a better view over the risks in our investments, and with a full history of any changes. Sharpfin’s founders, Billy Svensson and Markus Alin, joined forces in 2013 and dedicated their complementary skills to developing what is now Sharpfin Portfolio Management. They are passionate their mission to change the industry of financial software into something user friendly and efficient. We are proud to have recruited two very senior board members, who apart from the two founders, constitute the current board of directors. Upon finalized investment round we will appoint additional board member to create a long term government structure which will help us grow the company. Further more Heiner has worked as a derivatives trader and successful Entrepreneur as the co-founder of the pan-European options market-making firm Servisen Trading AG. Marcus is currently holding the position as Head of Contract Management at Ericsson and has vast experience from sales and contract negotiations in many countries around the globe. Marcus was one of the first external investors in Sharpfin and has a huge network of Banks in Singapore, Turkey, UAE and South Africa. Dr Thomas Wolfensberger - CEO of Peach Real Estate in Zürich and former CEO of Swissrisk AG. Thomas is extremely well connected in the Swiss banking scene and banks around Europe. Thomas is a great speaking partner when it comes to entrepreneurship, fintech growth and sales as well as being a door opener to many professionals and financial institutes. Dr Steven Bates - Founder of QLAB Invest and former director in UBS Wealth Management. Steven has a PhD from Cambridge University and worked with research at Cern Laboratories where he was one of the co-inventor of the Higgs particle detector 15 years prior to the particle itself was found. After Cern, Steven became a trader at Merrill Lynch before joining Swissrisk AG as Head of Products. What Steven doesn't know about financial investments and systems is not worth knowing. Peter Almberg - CEO of Katalysen & Partners. Peter has vast experience in the trading system industry and a great network of potential stakeholders for Sharpfin. Peter has been coaching us through the crowd funding process and been a valuable speaking partner for quality insurance of our investment material. John Zerihoun - CEO of Yamba.com - John is our speaking partner when it comes to communication, sales and marketing. He is a serial entrepreneur and knows basically everything when it comes to building companies. 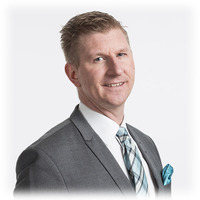 Per Torpare - Head of Wealth Advisory, Erik Penser Bank - Per is an experienced Head of Sales with a huge network in the Nordic Wealth Management scene. Per is our trusted speaking partner in questions regarding customer offering, target market and business development. Jonaz Kumlander - CEO of Doidea - Jonaz runs a successful inbound consultancy business and is our speaking partner for intelligence around marketing activities and building successful startups. Markus has a Master’s degree in Computer Science from Sweden’s Linköping Institute of Technology and has studied Economics at Switzerland’s University of St. Gallen. After completing his thesis, Markus served as IT architect at Credit Suisse Asset Management. In 2001, Markus joined the startup financial software provider Swissrisk AG. As part of their management team, Markus played a vital role in growing the company from three to 120 employees while acquiring clients such as Dresdner Bank/Commerzbank, Züricher Kantonalbank and UBS. In 2010, Markus became CEO of the Swedish portfolio management system provider, Triental AB, where his leadership contributed to increasing Triental’s turnover by more than 400% in three years. It was here that Markus met his future Sharpfin business partner, Billy Svensson. Billy studied at the Royal Institute of Technology in Stockholm but has been a programmer and architect for as long as he can remember. His chosen areas of expertise are data security and financial systems and processes. 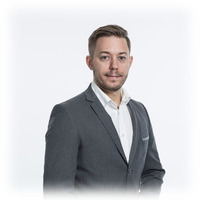 Billy’s distinctive record of achievement covers developing and designing intuitive financial reports, designing and implementing real time trading systems, and successful integration projects at banks and insurance companies such as SEB, Nordnet, Swedbank and Folksam. Billy is a successful entrepreneur with over 10 years of experience building successful startups (Sizo, Triental and Sharpfin). He has also functioned as a valuable resource to the Cinnober AB development team.